10in x 12in .025 metal with four 1/8 in mounting holes and 1/4in rounded corners. 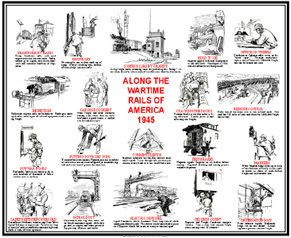 Tin sign of scenes and activities along Americas War Time Rails during World War II. Without the efforts of America's Railroads and America's automobile industry, we just might still be fighting WWII. A very interesting tin sign of Americas Rail History. Click on above image for zoom.